Lacoste continues a strategy of segmentation. The brand will present at Bread & Butter its new L!ve collection. This should replace Red! which was launched in 2009.
" Red!’s designs work well but we have decided to better identify the range. L!ve is a more extensive project," said Laurent Vinay, Devanlay Marketing and Communication Director, licenser of the green crocodile logo. While Red! only offered a dozen designs, L!ve is proposing for 2011 a vaster range with around forty designs for men, followed by twenty designs for women in autumn. The collection aims to "target the stylish" 18 to 25 year olds. To support this new launch, the line will have its own advertising campaign, and more importantly its own stores. From September, the New York store in Soho, which spreads over a hundred square metres, will be opened and decorated in the new concept’s colour range. Other store set-ups will follow on, including Paris, Berlin and Zurich. Eventually 40% of these concept stores’ products will be shoes. Clothing will be suspended. 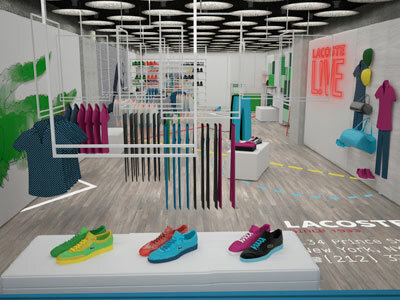 The medium term objective is to have 50 to 60 concept stores dedicated to Lacoste L!ve. "We clearly have a valid position in this updated vintage niche," says the manager. Lacoste, who wishes to renew its customer base, makes a clear bid for segmentation. Sportswear remains at the heart of the business, however, L!ve will soon account for 10% of the brand’s sales. The more technical ‘Lacoste Sport’ section should achieve a similar result. The Club premium range, which is also rapidly becoming independent should soon account for 8% of the crocodile’s activity.